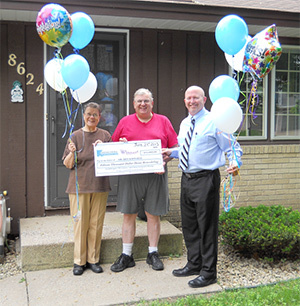 “K-Designers Branch Manager Mike Kveene stands with our most recent winners of the K-Designers $15,000 Home Makeover Giveaway Mr. & Mrs. Schwartz outside their home in St Paul, Minnesota. The winners had previously replaced the eaves and overhangs on their home with K-Designers premium America’s Dream Exterior products. One of their 5 entries paid off and they won the big $15,000 prize! The decided to apply a portion of their prize to invest in New America’s Dream Custom Energy Efficient Windows and took the rest in cold, hard cash.